Despite a few years past of uncertainty, following the exit of former owners Etisalat, and a protracted acquisition process, 9mobile, a reputable Nigerian, has managed to keep one thing smooth and seamless; its network. words like fantastic, great, efficient, best are often closely used when describing the telco’s network. And during its visit to the Nigerian Communications Commission (NCC), the regulating body for all telcos, the affirmation was reechoed with great confidence and optimism. While the Board of Directors of 9mobile interacted with senior members of the commission, it was again confirmed that the telco remained a highflier in terms of service delivery. So noticed was its dedication to excellent service that the NCC Executive Vice Chairman/CEO, Prof. Umar Danbatta, commended the telco for not only continuously meeting the key performance indicators on quality of service but surpassing the industry mark even during the trying time it went through. Led by the Chairman of the Board, Alhaji Nasiru Ado Bayero, 9mobile board members on the visit to the NCC headquarters included three Non-Executive Directors – Asega Aliga, Mohammed Edewor and Winston Ndubueze Udeh. Others were the Acting Managing Director, Stephane Beuvelet and Executive Director, Regulatory & Corporate Affairs, Abdulrahman Ado. Executive Management Team members including Chief Financial Officer, Phillips Oki and Company Secretary, Ore Olajide were also on the visit. Bayero, while speaking during an interaction with the executive management team of the NCC led by the Executive Vice Chairman/CEO, Prof. Umar Danbatta, commended NCC for its immense support alongside the Central Bank of Nigeria (CBN) in ensuring smooth and successful completion of the 9mobile acquisition process. “We have come to extend our courtesies to the NCC under the able leadership of Prof. Umar Danbatta who has been doing an excellent job steering the commission’s affairs. We are particularly delighted at the professional and thorough supervisory roles the NCC and other regulatory stakeholders played in the acquisition process of 9mobile”, he said. “I’m happy that the acquisition process is over and the new board, comprising eminent Nigerians with sound business and professional pedigree, has started steering the affairs of the company in the right direction. 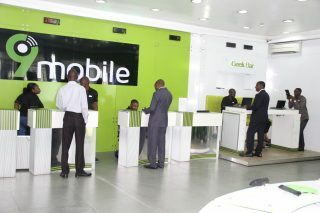 Now that this take over is concluded, I know that the new board and management of 9mobile are busy trying to ensure that the telco continues to provide the excellent services that they are known for and which is attested to by the quality of service which is characterized by some key performance indicators which the telco has never failed to meet even during the crisis period”, he said. 9mobile is Nigeria’s fourth largest telecoms operator and the telco in late 2018 successfully delivered a historic transition to its current shareholding structure and inaugurated a new board to chart the course of its next phase of success.